It's a somewhat little known fact that Lyndon B. Johnson loved cars, but the rather unique fleet of cars he kept on the ranch in Stonewall, TX where the 36th president grew up and lived for most of his life certainly tell the tale. The president had an Amphicar, a 1915 Type 12 American La France firetruck, a Fiat Jolly 500 that was given to him by the company and a 1934 Ford Phaeton he used for hunting on the 1500 acre ranch, but he was perhaps best known for the fleet of Lincoln Continental convertibles he used to survey the property. 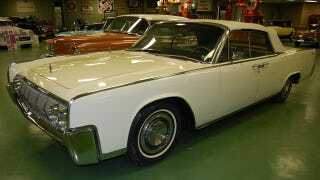 This 1964 Lincoln Continental Convertible was purchased new by Johnson for exactly that purpose. Reportedly Johnson believed the Continental was the ideal vehicle for navigating the rough roads that surrounded the ranch comfortably—even at high speed. During his retreats to the "Texas Whitehouse" Johnson would take this Lincoln on top-down rides around his property while drinking Cutty Sark Scotch and soda out of a foam cup—we imagine much to the distaste of the Secret Service agents who were tasked with shadowing the President and keeping his drink full. "Periodically, Johnson would slow down and hold his left arm outside the car, shaking the cup and ice. A Secret Service agent would run up to the car, take the cup and go back to the station wagon. There another agent would refill it with ice, scotch, and soda as the first agent trotted behind the wagon. Then the first agent would run the refilled cup up to LBJ's outstretched and waiting hand, as the President's car moved slowly along." Despite the Scotch fueled ranch tours, this Continental has survived in well kept original condition both inside and out. We aren't sure exactly what this Lincoln convertible will bring when it crosses the block on March 3rd in Texas, but we're guessing the Presidential history will command quite a premium. Proceeds from the sale will go to the Lyndon B. Johnson foundation, the cars current owner. According to Hemmings Blog, where we found this story, the foundation's purpose is "preserving the traditions and legacy of the President's life." We'd love to know how they feel about drinking scotch and touring the ranch while behind the wheel of a 1964 Lincoln.